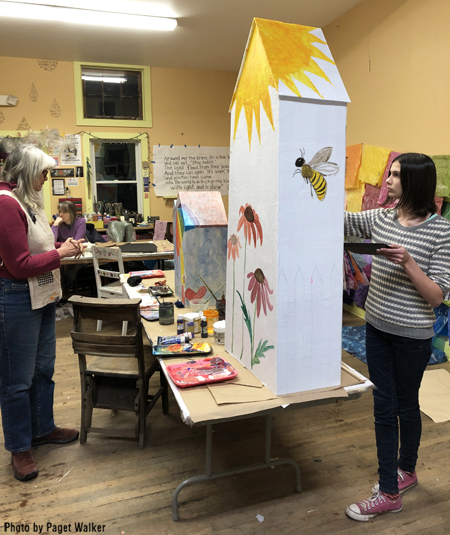 Our 2019 Winter HooPla was a magical event thanks to many artists, community volunteers and ARTeen interns. 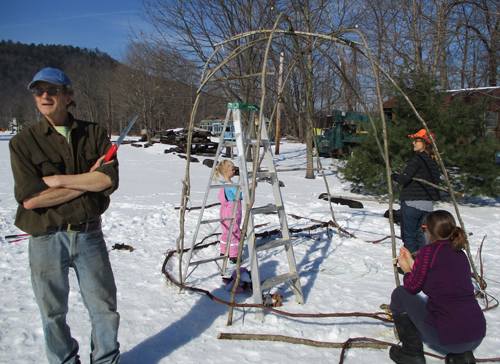 Work bees at The Art Garden are often intergenerational. 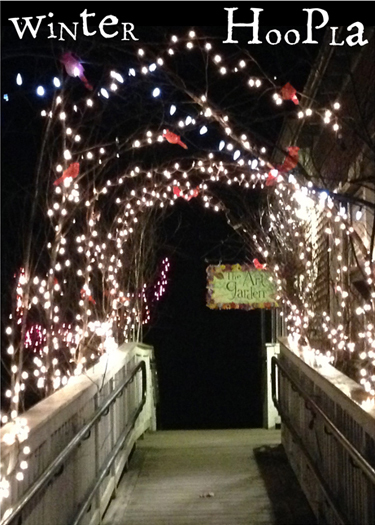 Together we imagined, built, glued, painted, tied, taped, hauled, constructed and lit up our railyard home with numerous ephemeral art installations. Wind gusts and icy conditions made it particularly challenging this year as many installations could not be completed until the last moment. Each year, the HooPla is a testament to creative problem-solving and resilience born through collaboration. 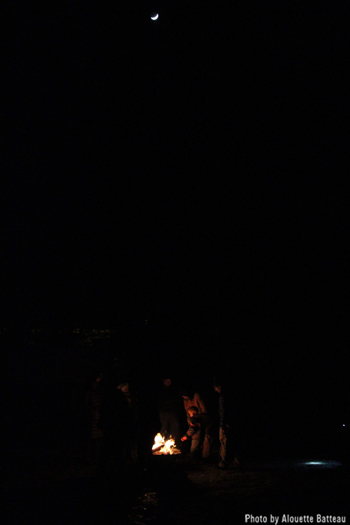 And then there is the absolute heart-strengthening wonder of people coming out in the dark and cold…to a raw February rail yard landscape…to experience and celebrate this particular place, our particular community…through art, LIGHT and the unexpected. 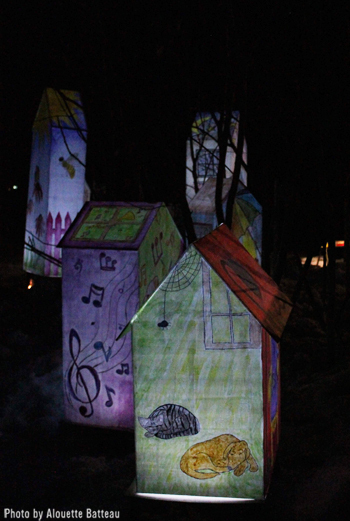 Many community artists helped Laura Iveson paint her installation of lit houses that reflected some of what we love about home. 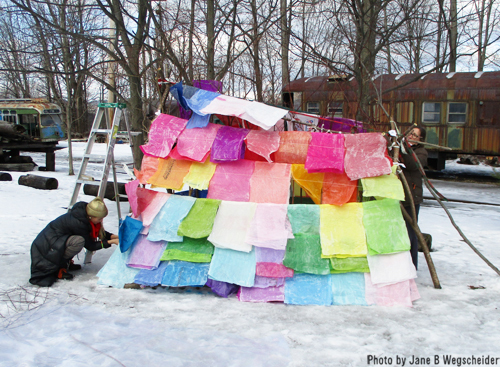 The houses were made from re-purposed corrugated plastic, tissue paper and cheesecloth. 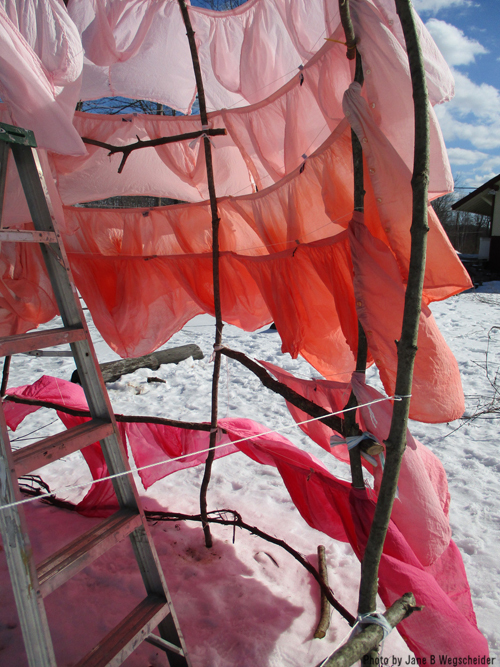 Samantha Crawford, Mia Radysh, Kate Hennessey and John Hoffman built four stick structures in the rail yard and covered them with re-purposed and upcycled materials: tissue paper glued onto used plastic bags and an “udder house” made from overstock shirts. The plastic bags (each individually-wrapped shirt came in) were also re-purposed into giant pompoms. 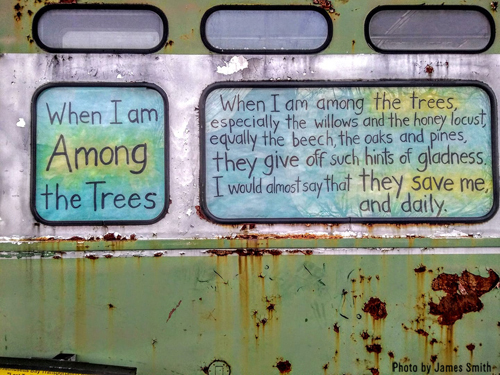 We honored the life and work of Mary Oliver with a few installations inspired by her poetry. 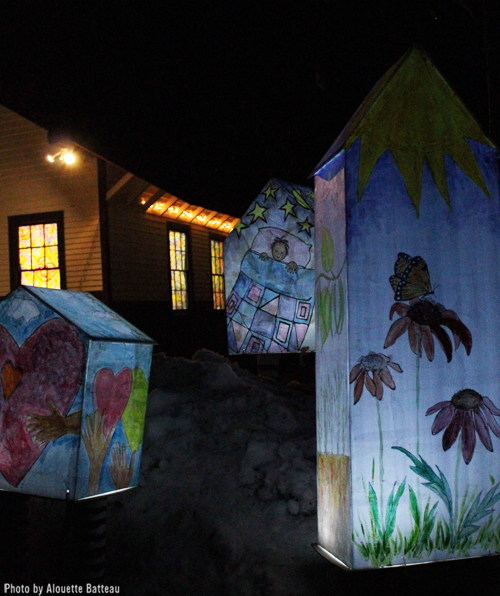 The opening reception for our community exhibit Small Kindnesses took place inside The Art Garden where people also enjoyed hot cocoa generously donated by Deans Beans. 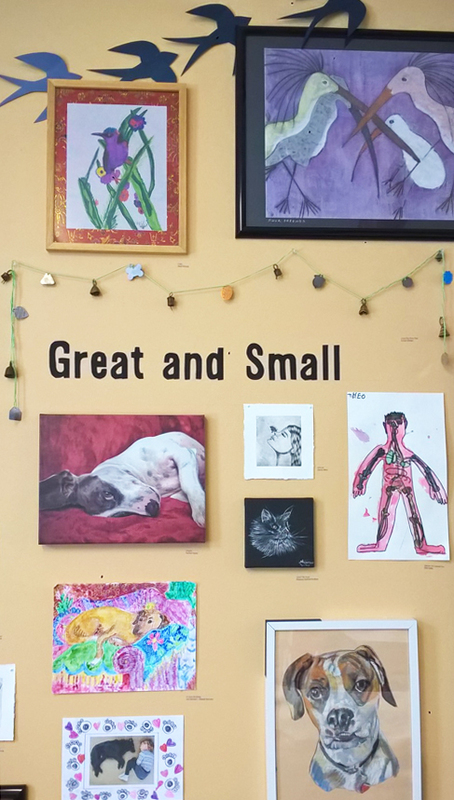 There are 48 works by 33 artists in the exhibit, which runs through April 6.
during our Adult Open Studio hours on Wednesdays, 10am-1pm. 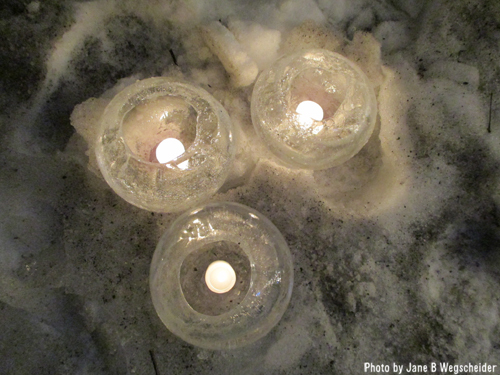 Fill medium sized round balloons with water and put them outside over night in below-freezing temperatures. In the morning, test whether they are done by puncturing one. The water in the center will not have frozen, leaving a delicate ice bowl. If freezing temps persist, you can leave them unpunctured longer, to make the bowl stronger. 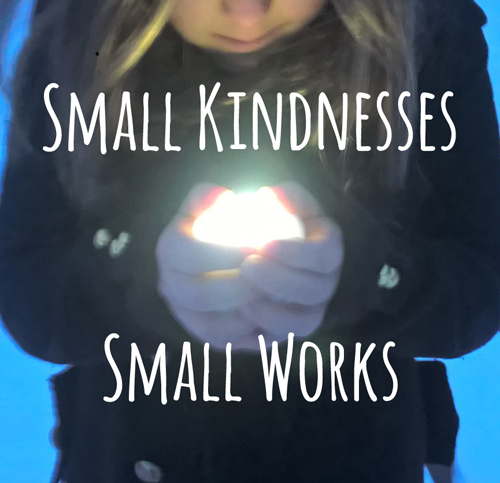 What are some of the small kindnesses you experience? That you offer yourself or others? That have been given to you? … a smile or hug on a gray day … a good book … a warm fire … making soup for a neighbor whose partner has been in the hospital … an unexpected call from an old friend … your dog’s kisses … ??? 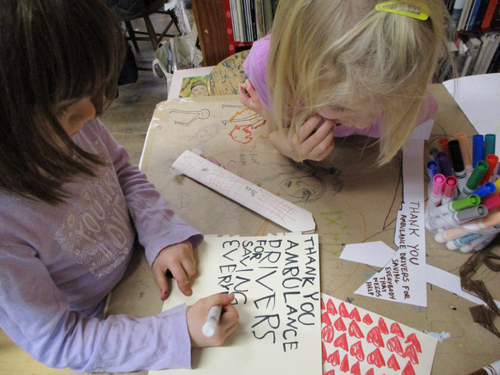 Emma (5 years old) creating a card at our recent “Gifts of Gratitude” workshop. 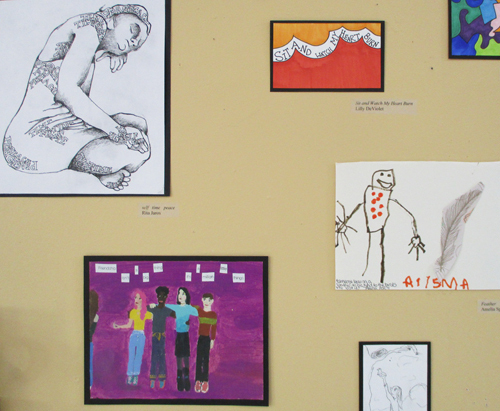 This exhibit is free and open to all ages and experience. All work should relate to the theme. Because this is a SMALL WORKS exhibit, we will be able to accept more than one piece from each artist. 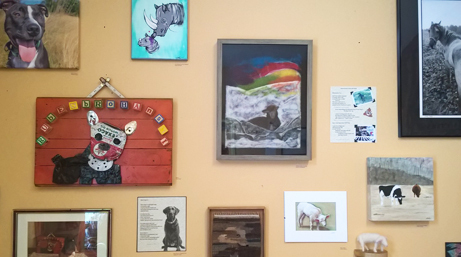 This includes framing if your piece is framed. It does not have to be! Writers please print or format your pieces to fit the size limit as well. More about the HooPla coming soon! 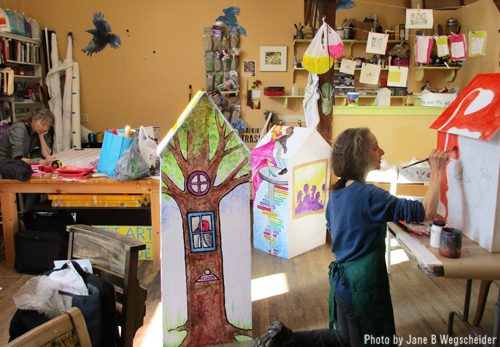 Re-purposing, re-cycling and re-using materials that would normally end up being discarded is something The Art Garden is committed to. 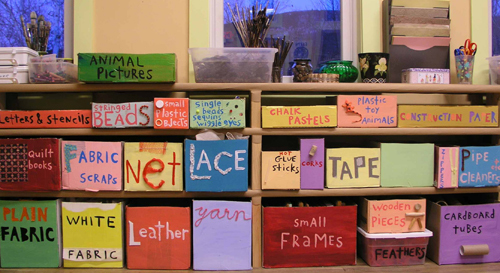 Our intergenerational studio is filled with high quality, traditional art supplies AND boxes and boxes of donated ‘discards’: fabric scraps, toilet rolls, bottle caps, buttons, tins and tea boxes, lace and netting, magazine images &&&. 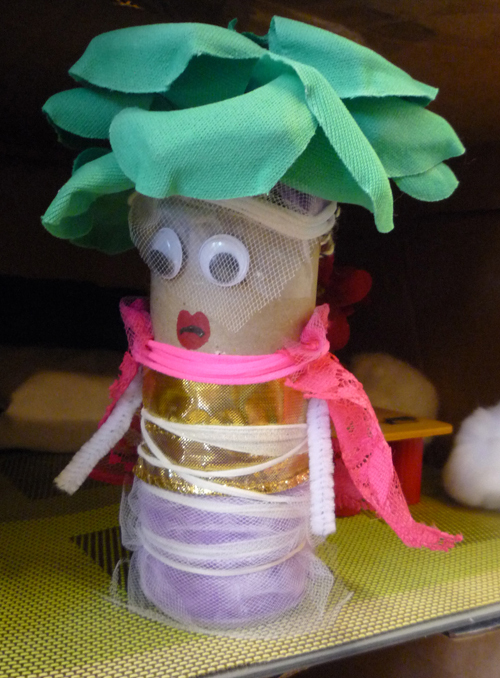 Children regularly transform trash into imaginative creations. 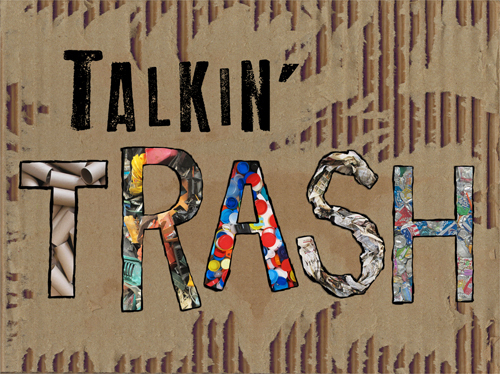 If you would like to submit work for our Talkin’ Trash exhibit, please bring it to The Art Garden ready for display on either Thursday, Friday or Saturday, November 1, 2 or 3 between 1pm – 5pm. Call 413-625-2782 if you have questions. with the ‘other-than-human’ among us. the unwashed macaroni pot hardening on the counter. slow a bit, on account of your dog. The dog is oblivious. That’s part of her charm. and shriek, “No!” right at the critical moment. She loves you anyway. She’s a dog. 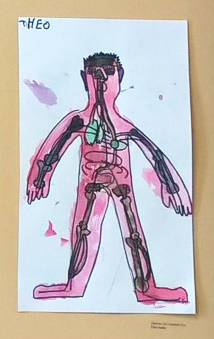 You, on the other hand, are inescapably human. to do when you got home. 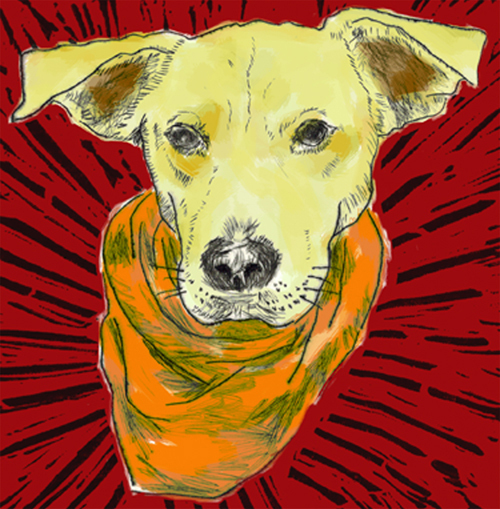 a lax, sideways smile—indulging you, indulging your dog. Cornstalks nudge one another as you pass. The dog could have told you that. and still be so far back there. Perhaps Super Honey Bunny will be here to greet you! 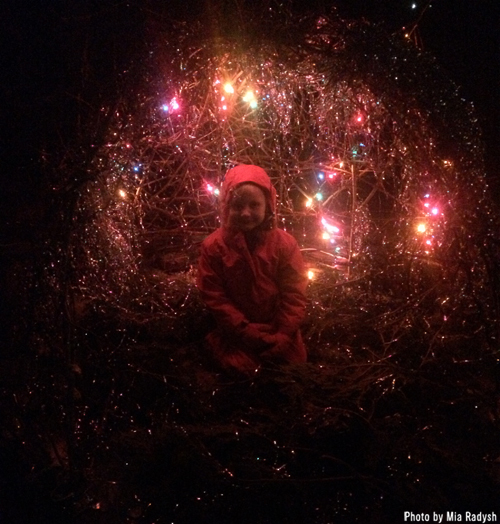 And thank you James Smith & Laura Iveson for taking exhibit photos for this post! 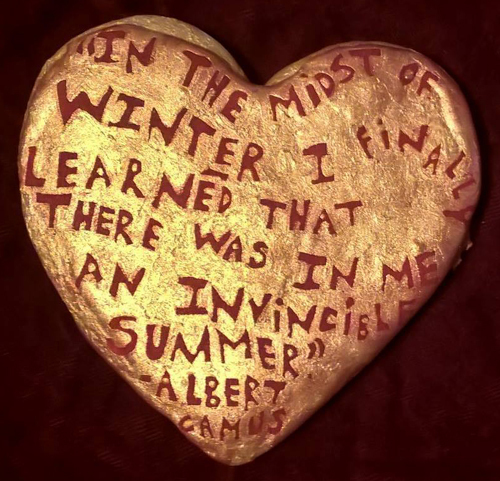 In the midst of winter: workshops, creativity, community! 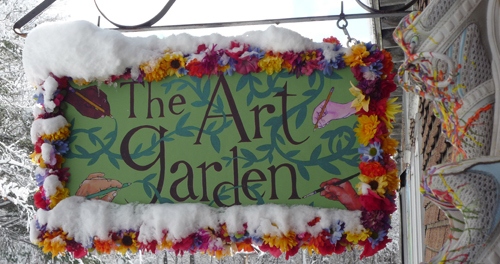 The next few weeks are busy ones at The Art Garden! 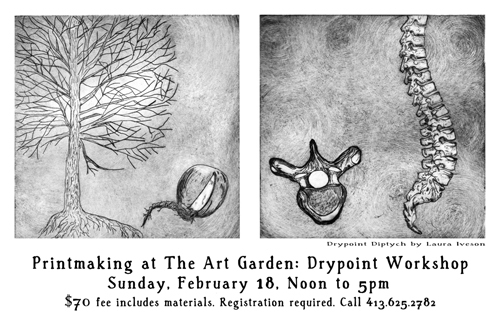 Laura Iveson and I will be facilitating this introductory drypoint workshop for adults [teens are welcome too!] using The Art Garden’s etching press and non-toxic Akua ink. To see some of the amazing drypoint prints created by the artist, Louise Bourgeois, click here. 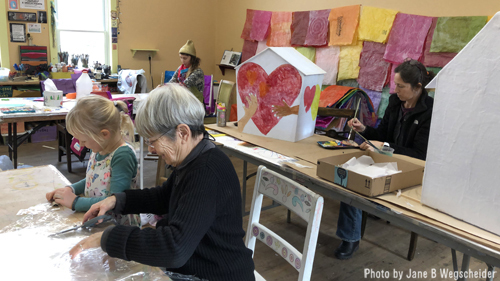 The Art Garden has invited several guest artists to our studio for this full week, February Vacation program; providing special workshops in the mornings followed by mixed media studio projects in the afternoons. All ages are welcome, including adults and teens! The full week program meets from 9am – 3pm, February 19 – 23, 2018. Morning workshops run from 9am – 11am. 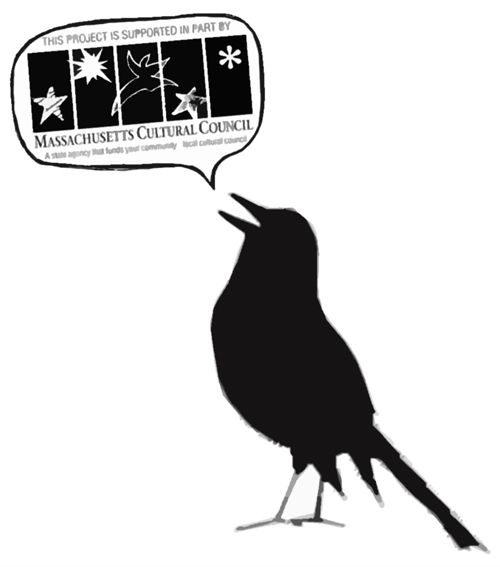 Register for one or more workshops, full days or the whole week! 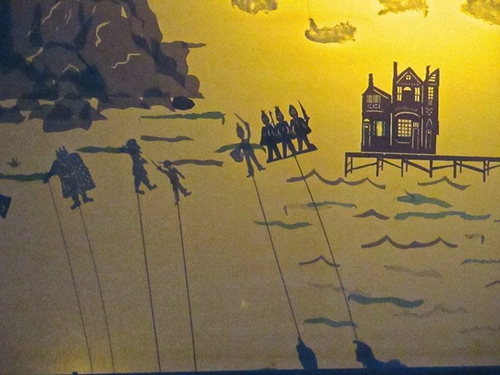 On MONDAY morning, artist and set-designer Laura Iveson will guide students in the making of Shadow Puppets. She will provide a Shadow Puppet screen for us to use for creating shadow-puppet plays. Impromptu performances will happen throughout the day depending on participant schedules. Dream Catchers (in Lakota Tradition) represent the web of life. They hang in homes to sift dreams and visions, letting the negative pass through, and holding the positive and helpful for the good of the people. 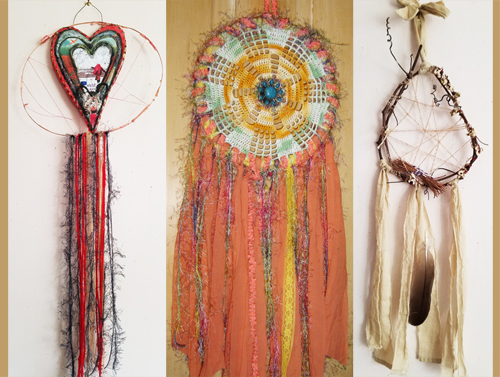 In this workshop we will use vintage linens; colorful textiles, ribbons and yarns; fun notions and baubles; and natural materials, to make unique dream catchers as gifts for ourselves or others. On WEDNESDAY, teaching artisan Leonore Alaniz invites participants to journey to the magic expanse of the sky and outer space. Inspired by music and visualizations, we will explore printing with recycled materials, gel plates and colorful non-toxic inks. Everyone will create a batch of unique images on paper and cloth: beautiful gifts that tell the story of imaginary space travel. 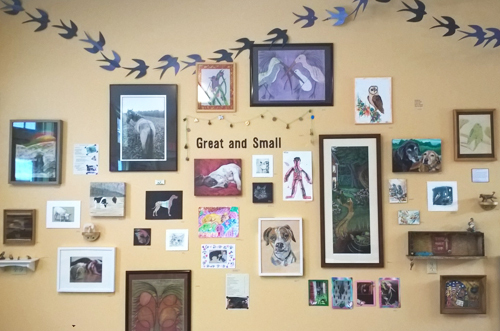 On THURSDAY, artist Mia Radysh will teach flat Needle Felting on wool felt. Cut out a crown, bracelet, play watch, or ornament shape to decorate, or make a patch for your favorite sweater. If you can draw or paint it, you can felt it! 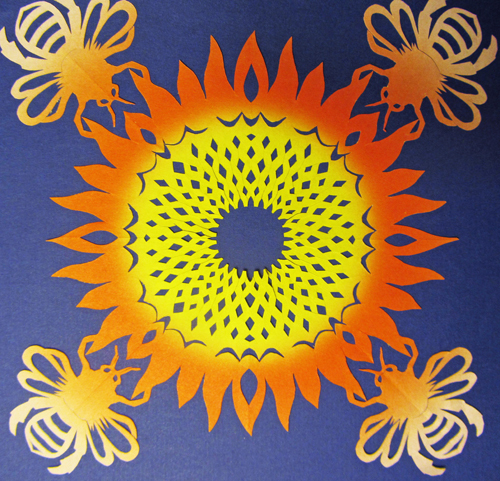 On FRIDAY, Jen Luck Hale will demonstrate her process for making intricate,cut paper art using multi-colored and patterned origami paper and tiny scissors. Jen will show students the basics for creating their own designs and patterns. 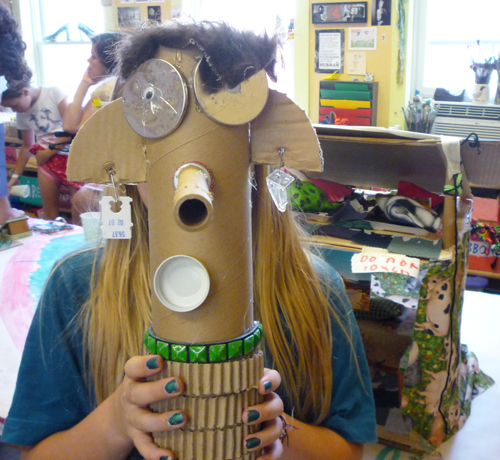 All workshops are tailored to accommodate a mixed age group. The Art Garden prides itself on fostering a culture of inclusion, where people of all ages and abilities are treated with equal respect. It is amazing what we learn from each other! 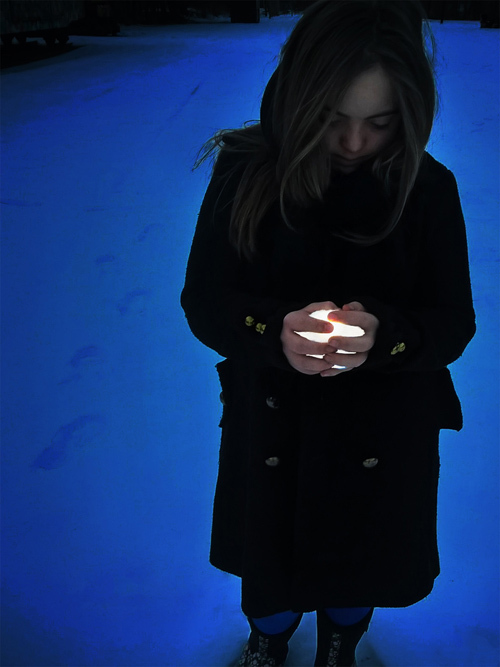 Join us for a little light in the darkness! Our Winter HooPla features a series of ephemeral, outdoor art installations using rail yard buildings, old rail and commuter train cars, and other site-specific features of the railyard landscape. In 2017, shadows cast from Reed Arahood’s carboard birds flew between large-scale shadow boxes set inside Freight house doorways. 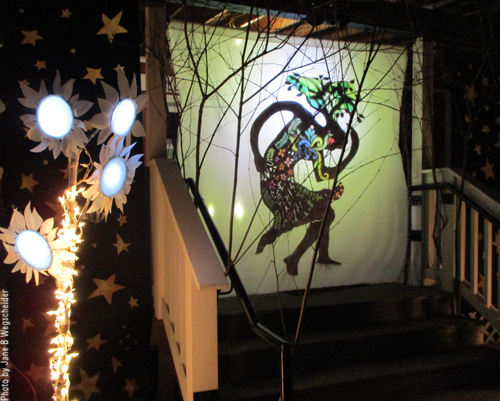 The shadow screens were created by Samantha Crawford, Jumi Shots and Laura Iveson. Photo by Reed Arahood. 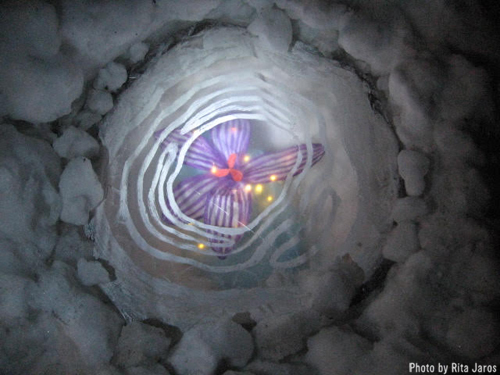 Under the co-direction of artists Laura Iveson and Jane Beatrice Wegscheider, guest artists and community volunteers co-create a magical environment focusing on winter myths, whimsical and ephemeral winter-related ideas and contemporary issues. 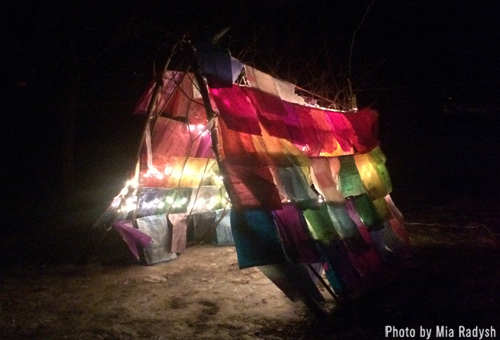 Installations are created using found, re-purposed, and natural materials, paper and light. 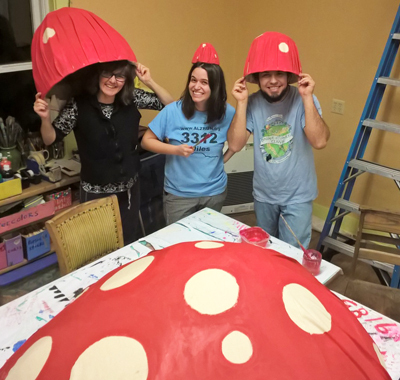 Brazilian guests helped paint the giant mushroom caps for Mia Radysh’ giant Mushroom Fairy Ring in 2017. 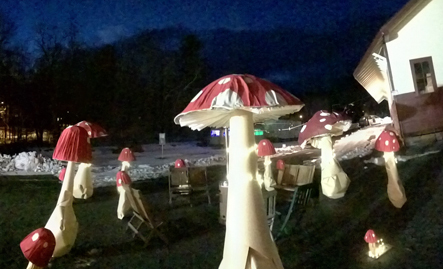 2017 HooPla Fairy Ring created by Mia Radysh. Photo by James Smith. 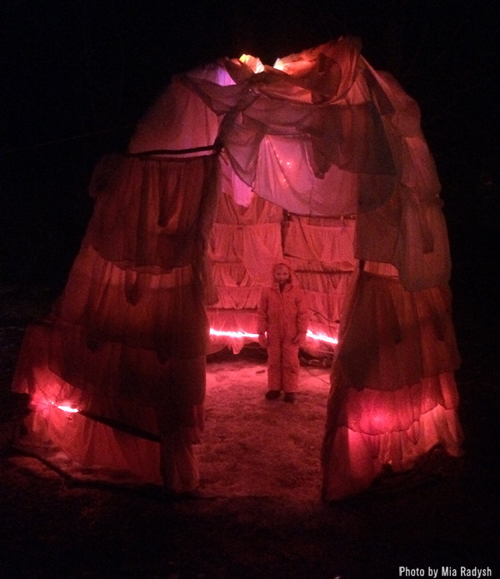 2016 HooPla historic T-car installation created by Laura Iveson. In 2017, Laura and volunteers transformed the historic T-car into an aquarium (using our giant Green River Festival cardboard fish.) What will it become this year? 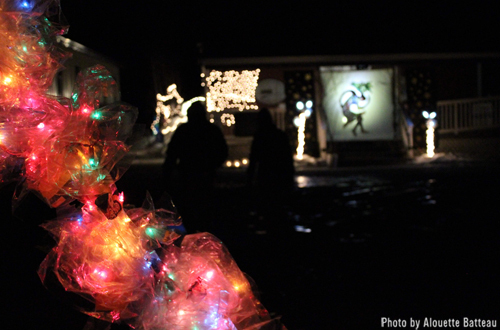 Our Winter HooPla is free and open to all! 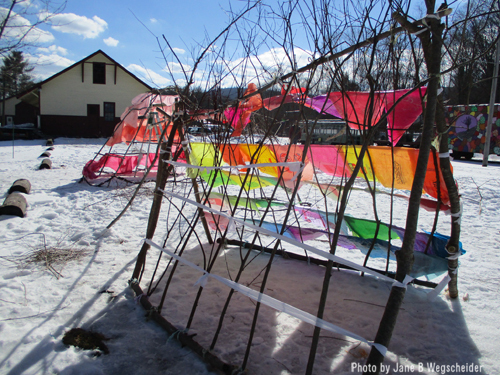 Hot cocoa will be served outside and light refreshments will be inside where visitors can also see Against All Odds: a community exhibit about Resistance & Resilience. There are 37 works in this exhibit made by 27 artists. 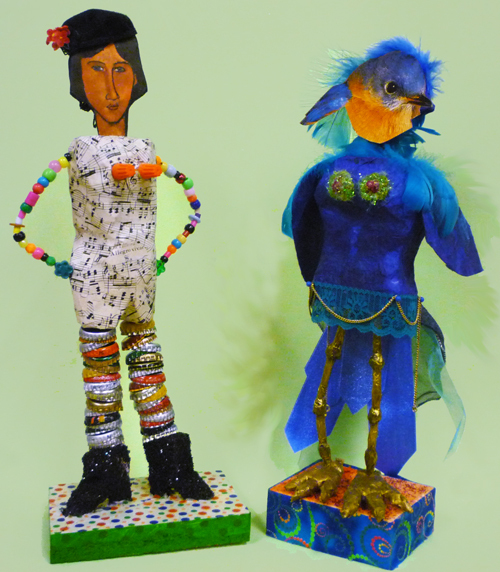 The HooPla is supported by a generous grant from The Art Angels. Thank you! 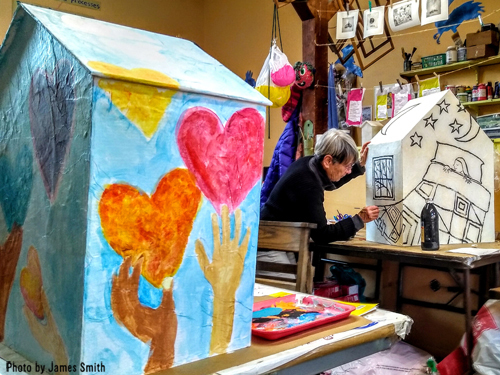 It would also not be possible without the hard work (often out in the cold) of many volunteers, community members and local artists. Thank you! Thank you! 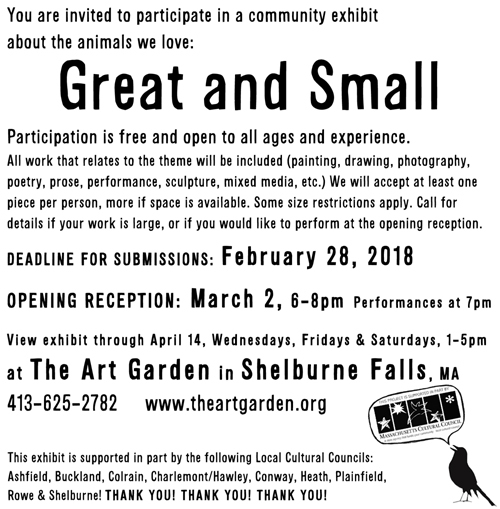 Community exhibits at The Art Garden are supported by the following local cultural councils: Ashfield, Buckland, Colrain, Charlemont/Hawley, Conway, Heath, Leyden, Plainfield, Rowe & Shelburne! Thank you! Thank you! Thank you! 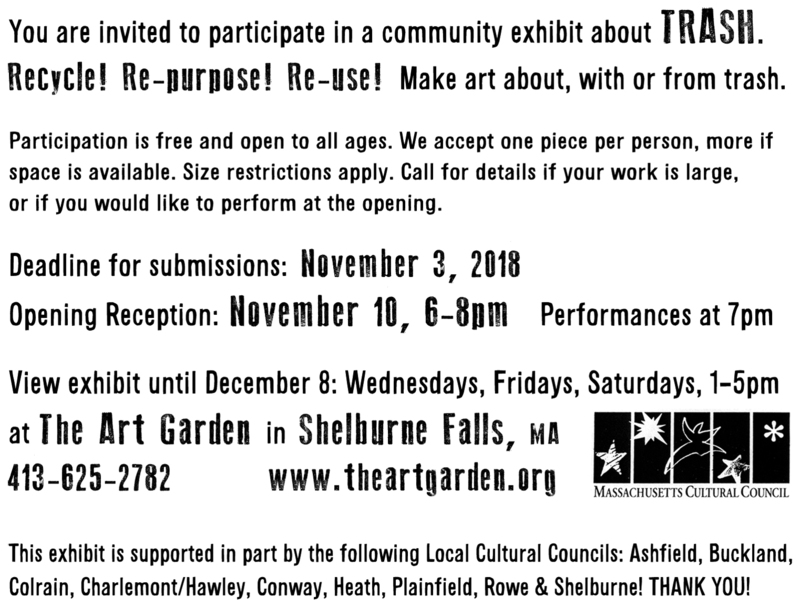 Thank you also to the Shelburne Falls Trolley Museum where The Art Garden is located. We are so grateful for all your support and the permission to play.